This stunning mid century chair is very much in the manner of Adrian Pearsall with the sculpted walnut legs, but without an original maker's tag we can't say for sure what its origins are. Regardless of who made it, we know that it was made well and looks incredible. We had the chair completely reupholstered. All new high density foam, batting, and fabric. 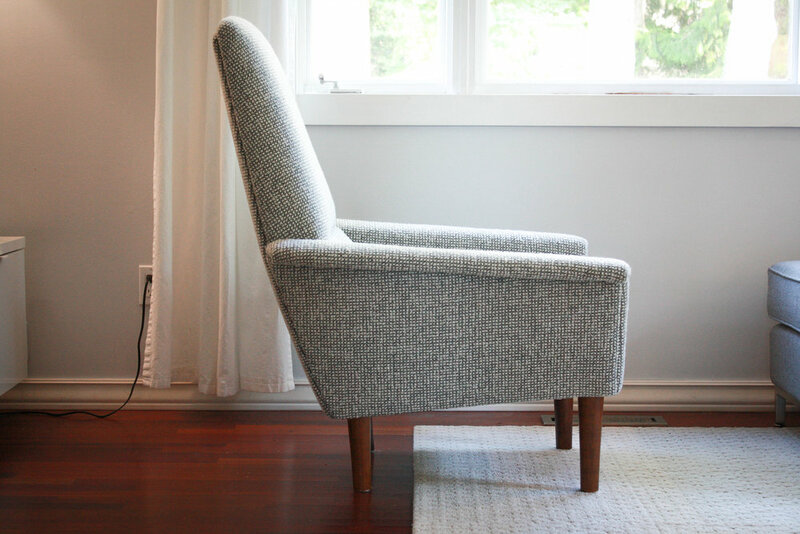 The fabric is Maharam Pebble Wool in Slate and runs $135/yard, this chair took five yards of fabric and is absolutely mind blowing. This fabric is rated for 100,000 double rubs which is one of the highest ratings possible and ensures the chair will stay looking this good for many years to come. Be sure to note the angled arms and side profile of the chair. The arms slope up from front to back, but the bottom of the chair slopes down which provides an insane geometric look to the chair. Sits on four walnut tapered legs.